Will be considering selling z4 soon and just looking for advice regards values before adding what i think its worth. Few details are below. The car is in pristine condition. Advert will of course have full details and pics once I get an idea of realistic prices. Last edited by the stripler on Wed May 16, 2018 5:23 pm, edited 1 time in total. SEAT Exeo ST170, superchipped to 215hp. z4 forum sticker, for added power. I would put it on for £6499 and not take a penny less. Check the market and take in to account your nice low miles and condition. I'm guessing a lot of people wouldn't pay a penny extra for outdated sat-nav on a recreational/weekender which most of these cars are now, so wouldn't worry about that affecting the price TBH. 2003 2.5 SE, low miles, Sterling Grey, 108's & Eagles, no stubby here! Unmolested. +1 on not being bothered about satnav. They look out dated now and technology has moved on light years since then. 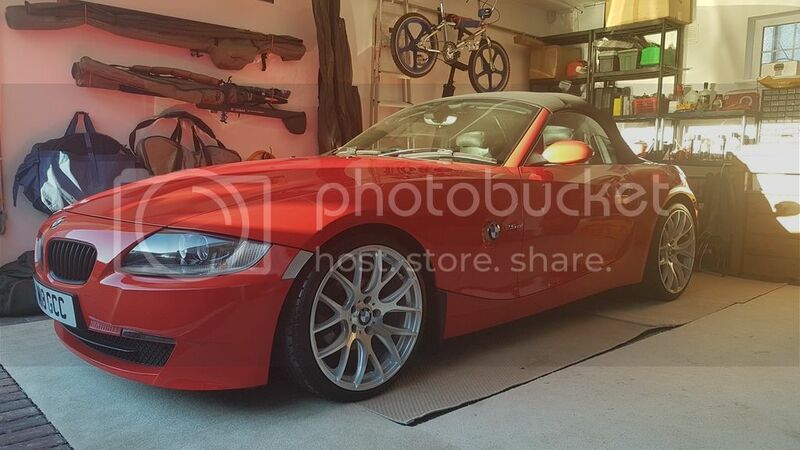 Your car looks fantastic OP - don't forget Red Z4s are pretty rare. I'm not really up to speed on E85 values, but don't price it too cheap - you can always drop the price, but you can't put it up! Z4 3.0Si Sport - Coupe for added stiffness! Current - Montego Blue, Pearl Grey, Cirrus trim & 295s. Cruise, Storage and pdc. E90 330i as a DD. Gone - Ruby Black, Pearl Grey & 135Ms. Xenons, heated seats and Professional speakers. For what it’s worth I like my satnav. I don’t use it for navigating (don’t need to) but have it set to maps all the time. Useful sometimes when it comes to speed cameras! Start with the forum buy and sell, and gumtree. Free to list so nothing lost. Appreciate all the advice. Not gonna be easy letting it go thats for sure. Going to sit on the idea for a week or so before doing anything drastic.